The £300,000 UK crime map launched today by the Home Office is a great step towards informing people, helping us understand crime better and hopefully helping us avoid and prevent it better too. 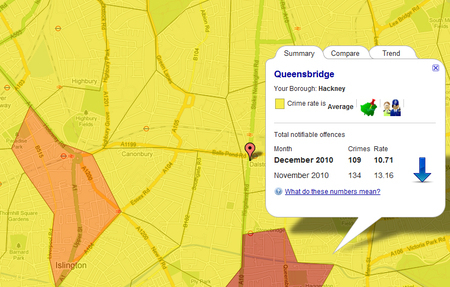 It’s not new though – we look at five other interesting crime maps where policing interacts with technology. The UK crime map is unique among them for being user-generated: six types of crime can be reported on the site and it also includes information about local police officers and their contact details as well as CCTV footage of people the Met would like to identify. A project that aims to trace all the murders in London since Jack the Ripper by mapping them on Google map of London. Each death has a memorial picture of the victim with some information about the circumstances of their death. Pretty grim, yes, but it’s interesting to see accumulation over the years. Same thing – just for New York, and it counts crimes since 2003. It’s an excellent example of data journalism by the New York Times. It includes brief details about weapons used, the motives of the killer and the ethinicity and ages of the victims and perpetrators. Not a map, no, but a fascinating chronology of a day in the life of a police force documenting how police time is spent and all the trivia and paperwork involved. Only a one day trial unfortunately. A neighbourhood watch type scheme which ranks cities and areas in the UK according to the crimes committed. The top ten areas include five in London with Nottingham, Liverpool and Manchester also featuring in the most crime-ridden list. Data visualisation and public services work well together..